A massive investigation into the Tsarnaev family that casts into doubt the notion that Dzhokhar Tsarnaev was the dupe of his older brother, Tamerlan. A harrowing two-part story on a supposed case of “medical child abuse” that raises serious questions about one of our most respected hospitals. And a feel-good story posted to Twitter that immediately goes viral. It was quite a two days for The Boston Globe, starting with the Sunday edition and wrapping up Monday evening, when staff reporter Billy Baker’s tweets about a poor teenager getting accepted into Yale were cited by the likes of BuzzFeed and Piers Morgan. It was the Tsarnaev package that has received the most attention. 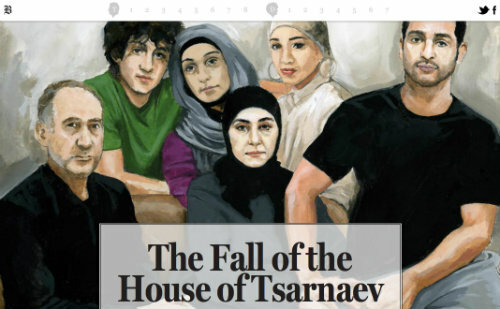 Reported by Sally Jacobs, David Filipov and Patricia Wen (Filipov, a former Moscow bureau chief for the Globe, visited Dagestan, where he learned of Tamerlan’s inept efforts to join an Islamist insurgency), the story provides the most thorough overview yet of a dysfunctional family dynamic that ultimately led the Tsarnaev brothers into terrorism. The story defies summary. For me, the most fascinating takeaway is that Dzhokhar, far from being manipulated by Tamerlan, was himself an angry young man and a big-time pot dealer who was at the very least a co-equal of Tamerlan’s. With Tamerlan reportedly hearing voices and seemingly unable to make coherent plans, Dzhokhar may well have been the key to pulling off the Boston Marathon bombings. Indeed, it was Dzhokhar, according to the Globe report, who downloaded an article in an Al Qaeda publication titled “Make a bomb in the kitchen of your mom.” No doubt this is the sort of thing we can expect to hear at Dzhokhar’s trial, especially if prosecutors seek the death penalty. One final point: Even though the Globe published a special eight-page section for its Tsarnaev story, the package was most fully realized online, where it received the large-type/big-art treatment that has become known as the “Snow Fall” effect, after a pioneering New York Times multimedia story. The message is that, increasingly, newspapers are treating their print editions as a secondary medium — even as they continue to bring in most of the advertising revenue. Abuse — or a terrible mistake? If it hadn’t been for the Tsarnaev package, I imagine the big news of the week would be Neil Swidey and Patricia Wen’s report (here and here) about Justina Pelletier, a 14-year-old from Connecticut who was taken to Children’s Hospital with what had been diagnosed as a metabolic disorder. Justina’s older sister had been diagnosed with a milder form of metabolic disease, yet was living at home with no apparent issues. Justina’s condition did not improve in the absence of her parents. Dr. Mark Korson, a Tufts physician who had provided the initial diagnosis, was treated with contempt by Children’s and not allowed to participate in Justina’s treatment. One inescapable conclusion: If the people at Children’s now harbor doubts about their actions, they dare not admit it because of the legal and professional ramifications. The case is as yet unresolved, and I look forward to learning more. It turns out that Baker had stayed in touch with the Huynh brothers after his story was published and had become something of a mentor to them. The tweets tell a full, deeply moving story, ending with George’s smiling face. I’m not sure Twitter is the best tool for narrative journalism, but Baker made it work. And he put a smile on everyone’s face just before Christmas. Correction: I misspelled Swidey’s name in the original post. Totally agree, Dan, that the Globe has crushed it this week. Billy Baker wringing that much emotion out of tweets may be the most impressive in some ways. Obviously, all these stories were in the works for a while, so who do you think is responsible at the highest level? McGrory? And does it say anything about what the Globe will look like during the Henry era? Also, doesn’t the fact that Bloomberg scooped the Globe (and the Herald for that matter) on the Scott Brown move mitigate the success of the week just a touch? @Keith: Any editor wants to win them all, of course. We don’t know how Bloomberg broke the Brown story — it may be just one of those things. As for McGrory, yes, sure. McGrory has had a terrific first year as editor. One way you might look at it is that as long as you’re taking care of the big stuff, you shouldn’t worry about the occasional incremental story like Brown’s move slipping by. I am constantly looking for signs of what Henry’s agenda will be. I think this week’s decision to hire a data-visualization journalist, Hilary Sargent, and assign her to work full-time for the free Boston.com site may say something very important (and encouraging) about his priorities. Sargent is exactly the sort of “luxury” that a penny-pinching owner wouldn’t even consider. @Keith: I guess I’m wondering, too, if Bloomberg really scooped the Globe, given this. There was a time–over a decade ago, and extending back through the 1980’s–when Howie Carr’s attacks on the Globe were refreshing and on-target. (Those were the days when Mike Barnicle spun his yarns, Bob Healy and Marty Nolan prayed toward Hyannisport thrice a day, and when Ellen Goodman helped to found the religion of Hillary-Worship.) Now, Carr’s rants reek of cheap demagoguery, ideological propaganda and vulgar viciousness. (Ironically–or, perhaps not so ironically–he’s become the virtual mirror image of the Globies he hates; Goodman’s shilling for the Clintons and Barnicle’s for the Bulgers have nothing on Carr’s modern-day persona as a mouthpiece for the Bush family, and the Republican Party.) Carr was once a worthy successor to Jerry Williams and George Frazier; now, he’s a second-rate Rush Limbaugh wannabe. @Hartley: Give Barnicle just a tiny bit of credit. He shilled for Bill Bulger and John Connolly, but not Whitey. That’s a Carr-created myth. Well, there was that time Barnicle wrote, “Pretty soon, they’ll be blaming Jimmy (the name Bulger fans called Whitey) Bulger for the Lindbergh Baby kidnapping,” or words to that effect. And there was that other time when Barnicle assured us that Whitey’s lottery winnings would go into the poor box at a South Boston church. Maybe you and I have different definitions of the concept of “shilling,” but that’s good (which is to say, bad) enough for me. @Hartley: I’ve written about this before. Howie also claimed in his Bulger book that a Whitey “sycophant” at the Globe wrote that “Jimmy kept the drugs out of Southie.” I did some pretty extensive research on it, and learned that the only Globie who ever wrote those words was Kevin Cullen — and he meant it as a refutation. Wouldn’t you love to see Carr repeat that to Cullen’s face? The Globe certainly did some excellent investigative work on Whitey Bulger, which Howie Carr has either not mentioned, or belittled and trivialized. Yes, the likes of Barnicle did write for the Globe, but, of course, so did Cullen and other reporters who did good, and even great, work on the story. My ultimate point is this: the pre-9/11 (the time, in my view, when, perhaps traumatized by the events of that day, Carr stopped being a journalist and became an ideological jihadist) Howie Carr wasn’t a political/cultural obsessive and bitter class warrior (who, apparently, still has a chip on his shoulder over having to go to North Carolina instead of Harvard, and rants about “trust-funders” as his revenge; an accomplished, successful man in his 60’s really shouldn’t act that way), but was still a must-read journalist (albeit, one with a very lively and entertaining writing style). THAT Howie Carr would have acknowledged that some people at the Globe did do great work on Bulger. Today’s Howie Carr is about as reliable and believable as Fox “News” and the Drudge Report–and for the same reasons. As a journalist turned ideological propagandist and personal score-settling obsessive, apparently he can no longer be trusted–even when it comes to aspects of the story that was his finest hour, the saga of Whitey Bulger. ” Now, Carr’s rants reek of cheap demagoguery, ideological propaganda and vulgar viciousness.”… this is new HOW? I remember when he used to refer to George Keverian as being (D-Papa Gino’s). He’s always played to the cheap seats.